All the graduates' names have been read and diplomas handed out. Now it's time to ditch the caps and gowns, cut loose, and enjoy a graduation party. A celebration is in order before they head out to conquer the world. Make it an awesome event with some of these great graduation party ideas with activities, games, decorations, and food. A photo booth a perfect addition to the graduation party. Not only do the graduates have loads of fun posing with their friends, but you also get to document their silliness and save the images forever. 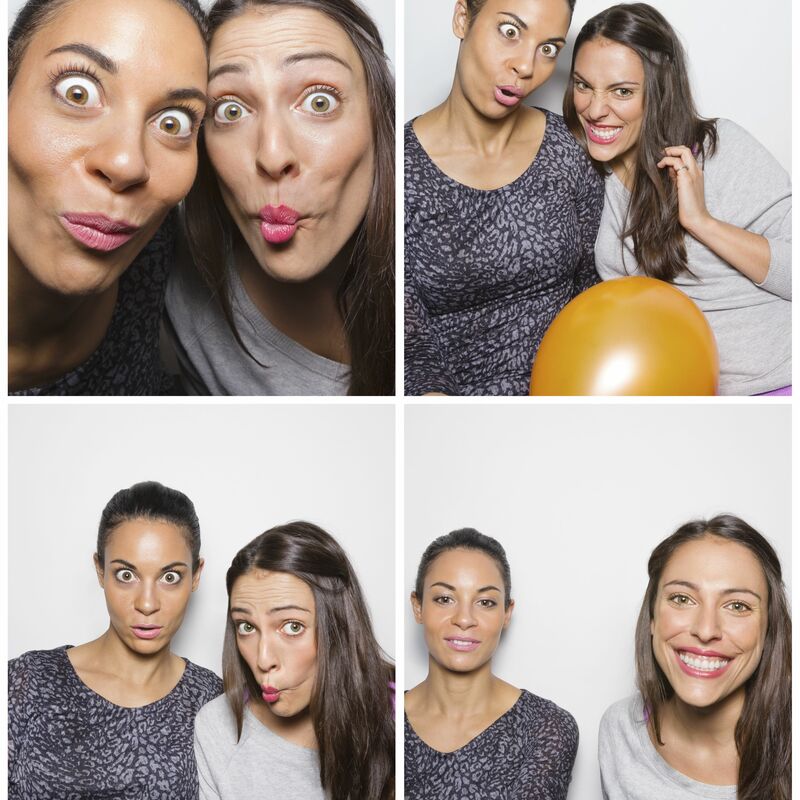 You can build or rent an actual photo booth for your party (the kind where you go in, draw a curtain and say cheese) or create a photo-taking backdrop where they can gather and strike a pose. Either option is exciting, but the backdrop works better for big group photos. Whatever way you do it, remember to add plenty of props to keep the photo booth fun going all night. Anywhere you have young adults gathered together you’re also going to have images and posts about what they’re doing popping up on social media. A party is a perfect place for multiple posting opportunities, so give your graduation party a hashtag (#emmasgradbash, #gradpartyforus) for them to use when posting their updates. This way they can keep up on everything to do with the event and maybe even get their hashtag to trend. Another fun idea inspired by social media is to broadcast a portion of the party via livestream. You don’t have to livestream the entire event but maybe plan ahead about a certain aspect that would be cool to feature. That might include all of the graduates doing a trendy dance, making speeches, or playing a goofy party game. Not sure about pulling off the whole livestream thing? Another option is to film a graduation party video and post it to a video sharing site like YouTube. Remember to share it with the party's hashtag. Once upon a time slideshows were boring presentations audiences suffered through at staff meetings or a neighbor’s gathering after a vacation. Not anymore. Slideshows have become fun ways to turn your photos into spectacular visuals complete with special effects, captions, and background music. Create a fun slideshow that stars the graduate and her classmates. Then project it on a big screen at your party. Forget that boring old banquet hall with properly set tables and fancy linen napkins. Throw a graduation party that’s less formal and more fun. Host it outdoors and instead of tables, set out picnic blankets on the ground. On each blanket add a picnic basket filled with everything you need to feed the group that gathers there. For the entertainment, have them play traditional picnic party games such as potato sack and relay races, This way of cutting loose may be just what your guests need after sitting through a stuffy ceremony in their caps and gowns. Turn your graduation party walls into chalkboards. Use chalkboard-faced, removable vinyl decals that can be arranged on walls to create varying sizes of chalkboards. Toss some chalk into the mix and watch your grads write messages, doodle and maybe even look back fondly on their days in the classroom. Spraypaint a giant Twister board on the lawn or create a human version of tic tac toe. Paint a checkerboard and give players red and black T-shirts to wear as they represent the pieces. Think about any party game you can turn life-sized, and it’s sure to be the hit of your graduation celebration. Another party game idea is to go back in time and have your grown party guests play games from their past, such as musical chairs, freeze dance, or the piñata game. It’s always exciting to open the yearbook and find out who earned superlatives like "Best Dressed" and “Most Likely to Succeed.” Way more fun, though, is to be able to assign your own superlatives to your friends. Before the party, copy and enlarge your guests’ yearbook photos. Hang them on a wall and set up a nearby table with markers and blank tagline cards they can fill in and tape beneath the pics. You can also throw in some funny superlative suggestions, such as Best Selfie Taker, Most Likely to Become a Reality TV Star, or Most Likely to Sleep Through the First Day of College. With just a few of these prompts, guests are sure to come up with plenty of silly superlatives of their own. There’s something quite magical about floating lanterns. Perhaps it’s the fact that they look like fairies flying in the night sky, or are reminiscent of shooting stars. Whatever the reason, you can bring the same kind of enchantment to your graduation party with a nighttime release of floating lanterns. Add some sentiment by having each classmate say something special (favorite high school memory, a wish for the future, etc.,) before sending off the lanterns. Not every party will have the open space required for floating lanterns. However, the same sentimental activity can be done with balloons. Have the graduates write their wishes on the balloons with markers and then set them free. For the graduate with a case of wanderlust, add a travel theme. Set up stations dedicated to possible travel locations. Decorate each station in a manner that reflects the culture of the region, and serve foods that are commonly eaten there. Tape a large map to one of the walls in your party room. Have all of the grads sign their names or pin pictures of themselves at the places on the map that they will next visit, where they will attend college, or where they wish to see someday. The years went by too quickly, no doubt. That "first day of preschool" picture feels like it was taken just yesterday. Chances are you have photos from every first day of school that followed, too. To create a sentimental party decoration, print all of those first day images. Then, hang a clothesline in the party room and turn those memories into a hanging timeline of your graduate through the years. Most high school grads may not be old enough to drink, but that doesn’t mean they can’t enjoy the party bar when it’s a taco bar, ice cream bar, latte bar, or something else that includes the fun of mixing non-alcoholic edible items. Decorate everything in the school colors. Invite guests to come dressed in them and even tailor your menu to feature foods that match the color scheme. If your graduating senior was into sports or a member of the cheerleading squad, you could throw your graduation party in the style of a tailgate party. Have guests decorate their cars, pop their trunks and enjoy outdoor grilled or picnic foods as they hop from tailgate to tailgate. Here’s a cool idea for a graduation party guestbook. Take the class picture and have it enlarged, and then paste it to a poster board. Draw puzzle-shaped lines on the back of the poster board, and cut out pieces along the lines. Have your grad’s classmates sign and write short notes on the backs of the puzzle pieces, and then put the puzzle together. The front side will show the completed photo, but when turned over, all of the messages will be there to read. Before the party, ask the other graduating guests to send baby pictures of themselves. Copy their yearbook pics as well. Hang the graduating pics on a wall and scatter the baby pics around the room. Challenge party guests to find the baby photos and then hang them next to the yearbook photos they think are a match. Use helium-filled balloons to create a whimsical photo display. Gather a collection of pictures of the graduate and her friends. Then use ribbon and a hole punch to attach them to balloon strings. Let the balloons fly to the ceiling, leaving the photos dangling into the party space. Graduation Hoods and Robes: What Do the Colors Mean?